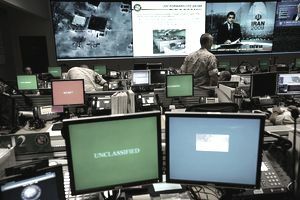 The Navy's crucially important work of deciphering encrypted communications and monitoring electronic networks for top-secret intelligence information is the responsibility of cryptology technicians. Within that field are several specialized ratings, including cryptologic technician collection agents (CTRs). A key part of the CTR's job is to intercept signals and transmissions, including some in foreign languages (although that's a different specialty altogether). This is a highly specialized, highly technical rating in the Navy, which relies on state-of-the-art equipment to get the job done. An interest and proficiency in technology and advanced computer systems are key for recruits who hope to enlist. CTRs perform a variety of duties worldwide at numerous overseas and stateside shore commands, aboard surface ships, aircraft, and submarines. In addition to collecting and analyzing communications signals, they provide analysis and technical guidance and targeting information to weapons systems while assigned to ships and submarines, and their work is used to help locate ships, aircraft, and submarines. They brief operational commanders when ashore and at sea. Cryptologic technicians have the possibility of a three-year tour of duty aboard a ship whose home port is Virginia, Florida, California, Washington, Hawaii, or Japan. Cryptology is conducted indoors, whether ashore at a base, or aboard a ship, submarine, or aircraft. They'll be closely supervised and have frequent contact and coordination with colleagues; this isn't a solitary job by any means. A combined score of 110 on the verbal expression and arithmetic reasoning segments of the Armed Services Vocational Aptitude Battery (ASVAB) test is required to qualify for this rating. Recruits must be able to qualify for a top secret security clearance, and a Single Scope Background Investigation will be required. CTRs need to have normal hearing and be U.S. citizens. Their immediate family members must also be U.S. citizens, and a personal security screening interview will be conducted. Former members of the Peace Corps are not eligible for this rating, and candidates need a high school diploma or equivalent. Recruits for this rating need an interest in electronics and good moral character as determined by the Navy. There are several other specialties within the cryptology technician field. These include cryptologic technician technical or CTTs, who are experts in interpreting and identifying radar signals, both airborne and shipborne. Cryptologic technician interpretive or CTIs are experts in linguistics interpretation. Due to the unique nature and specific skill sets required by sailors in the various cryptology communities, career paths are defined by whether they're within the continental U.S. (INCONUS) or outside the continental U.S. (OUTCONUS) tours, rather than the traditional sea and shore rotations. Sailors can expect to serve on various tours outside the continental U.S. and/or overseas tours, which count as sea duty, during their careers. CTIs can expect a rotation of one INCONUS tour, followed by two OUTCONUS tours, and so on, during their careers.